"Christy....It was so fabulous having your booth...what a hit, with both the kids and the adults! Many thanks again and look forward to doing it again next year." "You have a great business.... So, so fun!" I was going to write you too to tell you how much fun everyone had with you two and the booth. It was a big hit and the feedback was great. Everyone had fun with the props and they said you guys were great. The scrapbook was wonderful……I would like to refer you to other people. You gave us a great deal which made us able to add this fun thing to the wedding……I hardly knew you were there I was so busy but everyone raved about it. Thank you so much for being part of this wedding. And I love that you love meeting our friends and family......it's a great bunch"
"we had a wonderful time with your photo booth everyone enjoyed it!" "Thank you for a great time last night! The kids and parents had a blast!! We will definitely keep you in mind for out next event." "I just wanted to thank you for providing your photo booth services for Olivia's party. 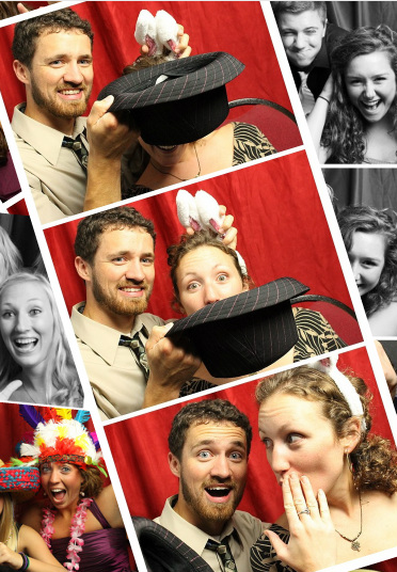 The photo booth was such a hit...the kids loved it! I'm really impressed with your professional set up and I will definitely share information with the schools for possible fundraising opportunities. Thank you very much for offering the deeply discounted rate to make it possible for us. With our two older girls in college, finances are super tight." "Thank you so much, the kids loved the photo booth. I have forwarded your information to our PTC, so they have it. I really appreciate you coming to our event! Great job"